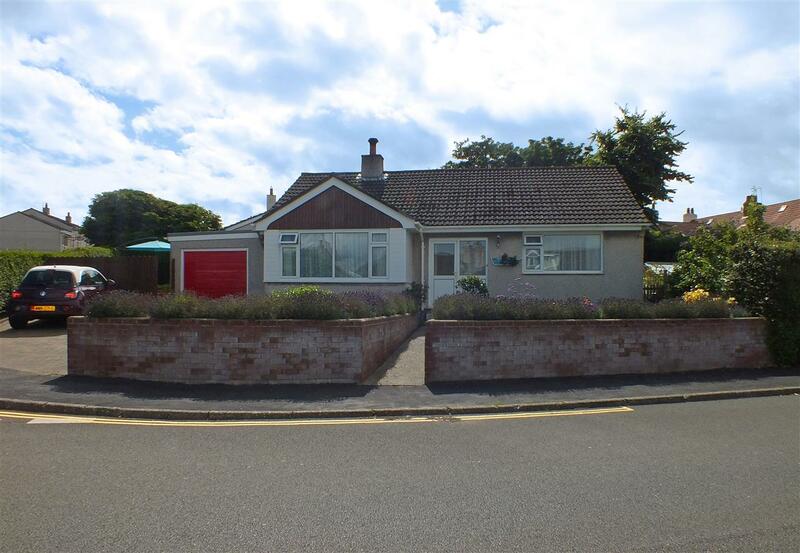 Deceptively Spacious Detached Bungalow with Development Potential. Occupying a Pleasant Corner Plot & Just a Short Walk from all Amenities. Suitable for a Wide Range of Candidates Either Moving Up or Down Sizing. Light & Airy Lounge and Dining Room with Conservatory Off. Modern Fitted Kitchen with a Large Utility Room. 2 Double Bedrooms, One with a Superb Range of Built In Furniture. Cloakroom / Dressing Room (Former Bathroom) & Separate, Adjacent Shower. 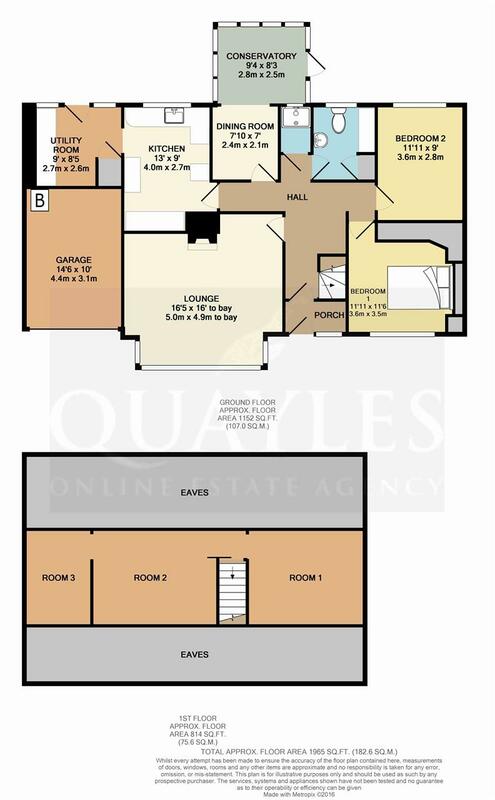 1st Floor Semi Open Plan Attic Rooms - Potential for 2 Bedrooms & En Suite (STPP). Gas Fired Central Heating to Ground Floor; uPVC Double Glazing, Fascias & Soffits. Attached Single Garage & Excellent Off Road Parking Facilities. Enclosed, Private Block Paved Patio with Pond. Rear Lawn with Sheds, 2 Greenhouses & Well Planned Vegetable Garden. Travel out of Port Erin along Station Road then turn right into Droghadfayle Road and proceed over the level crossing. Turn left into Erin Way where number 2 will be observed on the right hand side, on the corner of Athol Court. Having a half glazed uPVC entrance door and side panel. Shelf. Power point. Obscure glazed door to the entrance hall. A spacious area with an open area beneath the stairs which lead up to the attic rooms, with a sliding door at the top and coat hooks at the bottom. Power point. A glazed multi pane door leads into the lounge. A truly spacious room with a deep, square uPVC window to the front. Featuring a tiled fireplace with an oak surround and inset, glass fronted wood burning stove. Modern ceiling and wall lights. TV point. Fitted with a good range of traditionally styled white wall and drawer line base units together with 'Corian' work surfaces, upstands and an integrated basin. Space for a gas cooker and washing machine. Background tiling. Floating shelves. Slate effect laminate floor covering. Rear uPVC window. Clear opening to the utility room. A good size room with a base unit and worksurfaces to one wall with space beneath for a tumble dryer. Space for two full height fridge freezers. Obscure glazed uPVC window and half glazed door to the rear of the property. Built in store cupboard with shelf and light. Having a clear opening through to the conservatory. Of uPVC construction with a hipped glass roof and fitted roof blinds. Power points. Six opening top lights and a door to the rear garden. Fully tiled walls and floor. Enclosure with a glass bi-fold door, housing an electric 'Mira Excel' shower. Combined light / fan. A uPVC double glazed window opens into the conservatory. Chrome heated ladder style towel warmer. The former bathroom - tiled to mid height and fitted with a modern white suite of pedestal basin and WC. A useful triple cupboard with a tiled top provides a useful vanity space. Wall mounted mirror, power point and shaver socket. Obscure glazed uPVC window. Built in shelved airing cupboard. Fitted with an excellent range of bedroom furniture comprising wardrobes, drawers, over head units and a King Size bed base. Front uPVC window. A further double room with a uPVC window to the rear overlooking the garden. Wall light. Full width, semi open plan attic which has been insulated and boarded throughout. Comprising entrance area with a double room size space to the right, a similar space to the left and a clear opening to a further area. It would be possible to create at least two further bedrooms with the addition of dormer / Velux windows, doors and carpets. The former subject to planning permission and building regulations. Enclosed with low boundary wall, lawn and shed. Greenhouse. Pathway to a block paved area which in turn leads to a private patio with a raised lily pond. Hedges to boundary. Power point. Cold water point. Gated access to the block paved driveway for 2-3 cars. Laid to lawn with planted borders, raised beds and a central pathway to the main entrance with night light. Gated access to the side vegetable garden. A well planned, highly productive space with planted beds, fruit trees and a greenhouse. All mains serivces installed. Gas fired central heating & uPVC double glazing, fascias and soffits.